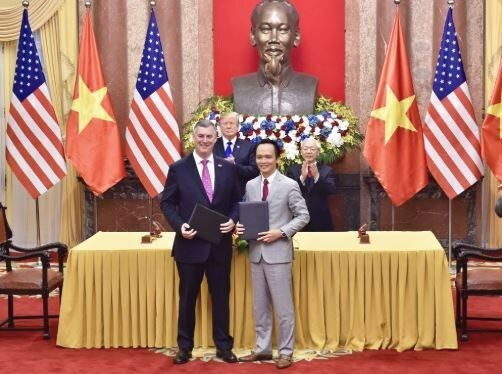 Vietjet Air President and CEO Nguyen Thi Phuong Thao and BCA President and CEO Kevin McAllister signed the deal on February 27, witnessed by Party General Secretary and President of Vietnam Nguyen Phu Trong and US President Donald Trump. The signing ceremony took place on the occasion of the DPRK-USA Hanoi Summit Vietnam on February 27-28. Kevin McAllister said the BCA is pleased to expand its partnership with Vietjet Air and contribute to the carrier’s growth. The new and state-of-the-art airplanes such as the 737 MAX will help Vietjet grow more efficiently and bring great travel experiences for its passengers. The strong growth of Vietjet and the country’s aviation sector has helped stimulate travel within Vietnam and connecting Vietnam with the rest of Asia, he said, adding that Boeing is proud to support this economic development, which in turn supports engineering and manufacturing jobs in the US. In 2016, Vietjet Air signed an order for 100 B737 MAX planes with Boeing - the biggest commercial aircraft deal in Vietnam’s aviation industry. It is now the largest B737 MAX customer in Asia. Vietjet Air President and CEO Nguyen Thi Phuong Thao said the signing of today’s deal is one of the important steps of Vietjet in its international flight network expansion plan with a higher capacity, thus offering passengers with more exciting experiences when being able to fly to more new international destinations. In addition to the aircraft deal, Boeing will partner with Vietjet to support the airline as well as the Vietnamese aviation industry to enhance technical expertise, train pilots and technicians as well as improve management capabilities. The same day, Vietjet Air and the US’s General Electric Group signed a 5.3 billion USD agreement on long-term service maintenance of LEAP-1B engine. The agreement includes the provision of backup engines and service packages for the new and modern aircraft that the airline had ordered. Bamboo Airways, Vietnam’s newest carrier, signed a nearly-3-billion-USD contract to buy 10 Boeing 787-9 Dreamliner wide-body jets with the US group on February 27. 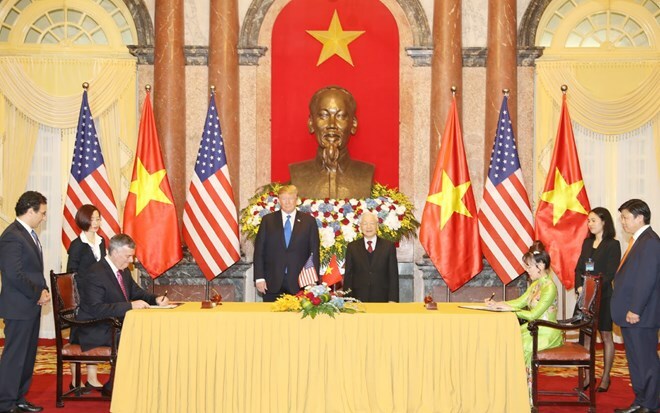 The signing ceremony took place on the sidelines of the DPRK-USA Hanoi Summit Vietnam, in the presence of Vietnamese Party General Secretary and President Nguyen Phu Trong and US President Donald Trump. Kevin McAllister, CEO and President at Boeing Commercial Airplanes Inc., said that the new contract will help promote and consolidate the partnership between Boeing and Bamboo Airways. Boeing is willing to support the Vietnamese carrier in connecting Vietnam with key markets in Asia, Europe and North America, he added. Last June, the carrier, owned by property developer FLC Group, also signed a deal to buy 20 Boeing 787-9 planes worth 5.6 billion USD. The first planes are expected to be handed over to the carrier in the third quarter of 2020. Bamboo Airways is considering the purchase of 25 Boeing 737 Max narrow-body jets with an estimated value of 2.5 billion USD. Dang Tat Thang, General Director of Bamboo Airways, stated that the airline’s moves are aimed at improving its operation and increasing competitiveness in potential but challenging international routes. In March 2018, Bamboo Airways inked a deal to buy 24 Airbus A321 NEO planes worth 3.2 billion USD, under the witness of Party General Secretary and President Nguyen Phu Trong and President of France’s National Assembly Francois de Rugy. After its first commercial flight on January 16, 2019, the airline has conducted over 1,000 safe flights transporting around 90,000 passengers. It plans to operate 37-40 domestic air routes this year, contributing to promoting trade and tourism between regions. The airline also aims to launch international service in the second quarter, with the first destinations slated to be Thailand, the Republic of Korea, Singapore, Japan, Taiwan (China), Australia, the UK, France and China.